Questing Vole – 60ft Cruiser narrowboat is a 2008 cruiser stern built by Hexagon Narrowboats. She has many interesting characteristics which make her unusual and she is a lovely vessel. Starting from the bow, which houses the water tank, the well deck is very deep. It has seats / storage lockers around and a demountable table which offers al fresco dining, cards, morning coffee etc. Into the saloon. A lovely room with an armchair, a solid fuel stove, cupboards and shelves and an 18” TV / DVD combo. There are a couple of unusual roof windows in this room which provides additional light. The L shaped dinette with storage under follows. This offers dining for up to six people, and converts very easily into an additional double berth. The galley is next and has lots of storage space. The side hatch in here is unusually wide, there is a large floor to ceiling larder cupboard with drawer (with freezer connection point), 4 burner gas hob, oven / grill, microwave and fridge. The bathroom is spacious at over 6’ wide and houses the Thetford cassette loo, a ceramic basin, a big quadrant shower and towel rail. And into the bedroom at the stern. The bed is 6’4” x 4’ but extends to 5’ wide. The cassette is under, along with storage, and at the foot of the bed there is a good sized wardrobe and a huge wet locker / wardrobe with a moulded plastic base with plug hole in for wet clothes! Up to the stern deck which at 9’5” long is probably the longest I have seen. The very clean Nanni engine is housed under. Head height in this boat is 6’7”. The on board heating is provided via the Alde gas central heating (as well as the stove) and 230v power is supplied either via the landline or the Victron inverter. 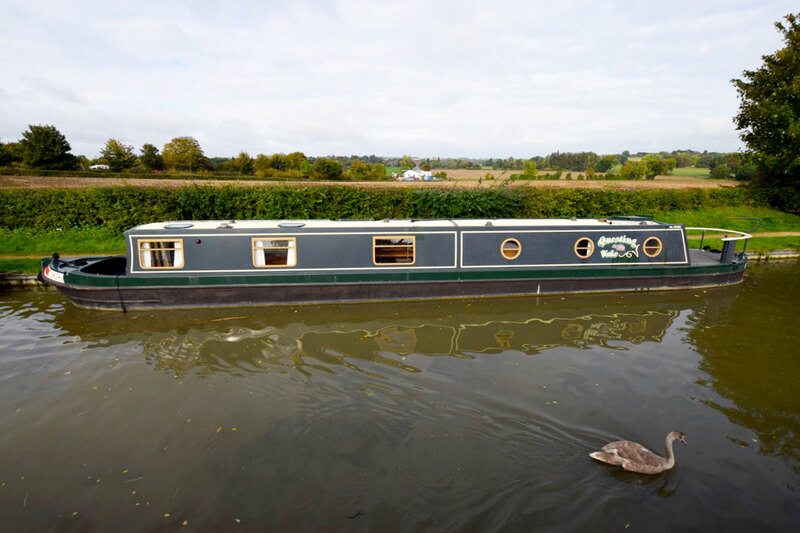 Questing Vole – 60ft Cruiser narrowboat is a boat with real character, and is ready for immediate living aboard or just intermittent / extended cruising.